The HB96 was my first sup purchase 1.5 years ago. I greatly enjoy the portability of inflatables as I live in an upstairs apartment. Just let it dry and it’s ready to store in a closet. I’ve ridden my HB96 at lakes, harbors, calm rivers and it performs well. Standing isn’t so hard as the board is pretty stable. I’ve surfed on small to medium sized waves which is fun but challenging. Recently I’ve been learning whitewater paddling on class I and II rapids which this sup handled well. When I fall off it’s because of my clumsiness, not the board. What I nicely find is the HB96 sup is versatile for many applications. Sea Eagle has provided excellent customer service; I’ve needed replacement parts and received quick help from their staff. Five stars, well deserved. We like it!! Big fans of it for being very small and portable. We packed a couple of your SUPs to Belize, and determined it to be an excellent decision. It allowed us to explore the shores of Caye Caulker, and have platforms for our own snorkeling adventures! Summary: Sea Eagle Hybrid is a great product that you can fit it tight places with its unique design. 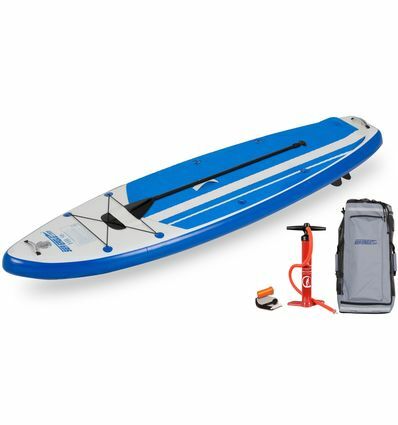 This board is very versatile in design and you can get a great workout while on the water. I highly recommend this procduct. 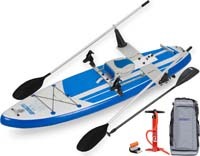 Summary: Sea Eagle carries great products from their paddle boards to their kayaks and are great and easy to transport. We Carrie ours in our Dodge Challenger when getting on the water. All in all this is a great and fun product that I highly recommend to everyone.